Two former champions bit the dust as the opening action in the Weslo Seniors Open began. Gordon Scott (2012) of Armadale and Gordon Logan (2014) of Kirkliston are out of the end of season major. 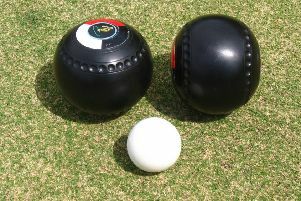 Players from 34 clubs of The West Lothian Bowling Association set out for the coveted trophy and the first headline makers are Freddy Dailly of Oakbank and Allan Lynch of West Calder. Dailly captured the scalp of Scott in a 21-15 upset while Lynch produced an even stronger performance to progress at the 21-8 expense of Logan – a former County Singles champion in the mainstream. The first round proper was denied a third personality figure in the shape of John Black, the celebrated 2014 Scottish Seniors Champion who was injured. Three close encounters in the prelim round saw Charlie Houston of Kirkliston win an epic 21-20 battle with John Traynor of Pumpherston while John Weir of Whitburn edged a 21-19 thriller over Eddie Scott of Harrysmuir and Bill Whaley of Watson Memorial did likewise at the expense of Whitburn’s David Gracie. Today’s first round proper brings title holder Bob Mackay of Armadale against Bill Close of Kirkliston at Kinneil while recent District champion Robert Saunders of Whitburn faces George Marshall of Pumpherston at Buchan Park. Football legend Colin Stein wants to win the coveted trophy and the Linlithgow star launches his campaign against Clark Steele of Watson Memorial at Kinneil. Meanwhile, while bowls fans on social media debate whether recently crowned Tait Trophy champion Liam McKay of Tanfield is the youngest winner at the age of 21, the Evening News has spoken with Colin Mitchell of Carrick Knowe who confirms he was 17 in 1991 when winning the first of his five Tait titles. Mitchell won all five by the age of 30 and that is a record that will take some beating.